Lesson 3 – The value of a mutation (good, bad, or neutral) changes with the environment. A mutation that appears to be bad in one context, might be good in another. So far we have seen that mutations are common enough in nature, that bad mutations can hide as recessives within a population (contributing to the population’s overall genetic diversity), and that mutations can have anywhere from hugely negative effects (ie lethal mutations) to almost negligible effects. What Dobzhansky has not yet shown is that mutations can be beneficial to the organism. Since selection has had thousands of generations to work on a population, we could presume that that population contains a construct of genes that are well-suited to the environment. A random mutation would therefore be more likely to disrupt that genetic construct than to improve it. But, says, Dobzhansky, this assumes that the environment will always be the same. In reality, the environment changes. As we have learned, selection will have a difficult time removing every harmful mutation, because any harmful recessive mutation can hide from selection. Occasionally, two parents who are both carriers for the same recessive mutation will mate, and some of their offspring will inherit both recessive alleles. Selection can remove these offspring from the population, if the mutation is harmful enough. But the rest of the offspring will be either normal or carriers, and the carriers will continue to store the harmful mutation. But what happens if the environment were to change? Suddenly all bets are off – the population may no longer be well-adapted to the new environment. Some of these harmful hidden mutations (or neutral mutations), however, may, by chance, be useful in this new environment. Any carriers that mate with other carriers are now at an advantage, as any offspring that receive both mutated alleles outperform their normal brethren. The once-harmful mutation can now accumulate rapidly in the population, and the population will have evolved. Does this scenario sound far-fetched? Dobzhansky presents evidence to suggest that it is a very real possibility. Banta and Wood, in 1927, published their observations from working with the freshwater crustacean, Daphnia longispina. 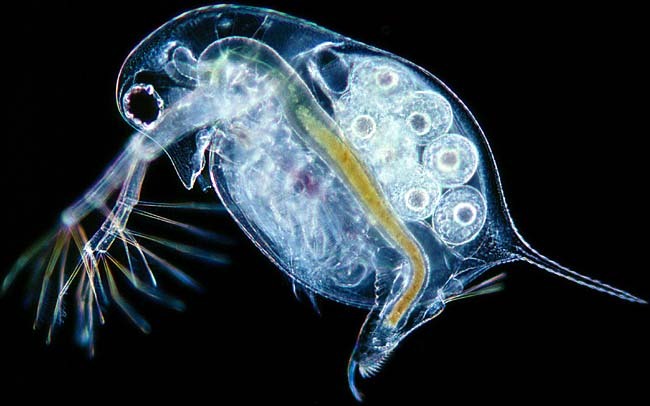 This species of ‘water flea’, as they are called, easily survive in the laboratory at 20 degrees C, but a slight increase in temperature can be lethal, and they absolutely cannot survive at 27 degrees C. In the course of their study, however, Banta and Wood discovered a harmful, lethal mutation in Daphnia. Under normal laboratory conditions (20 degrees C) all of these mutants would die. Interestingly, however, these mutants could survive at temperatures between 25-30 degrees C. Therefore, if in the wild the temperature hovered between 25 and 27 degrees, both the mutants and the wild-type would thrive; at lower temperatures the mutants would die, but at higher temperatures the wild-type would die while the mutants would thrive. What, then, do we mean by ‘good’ or ‘bad’ mutations? As further proof of this, Dobzhansky looked to nature and found a whole suite of mutations among insects that we would consider harmful but which, in their environment, either brought them no harm or actually benefited them. Some insect species have mouthparts that are incapable of consuming food; some have twisted genitalia; some lack eyes. Our human understanding of the world causes us to pronounce these mutations as harmful, or even monstrosities, and yet in the insect’s environmental context it serves them just fine. Today we know of numerous examples of these context-specific mutations. The textbook example is sickle-cell anemia. I have been writing so far as if carriers and wild-type are phenotypically identical, but this is not always the case. Sometimes carriers have a weaker expression of the mutation than those who have both copies of the mutation. Sickle-cell anemia is the result of a single mutation in a gene that codes for haemoglobin, which is a component of red blood cells. This mutation swaps glutamic acid for valine on the sixth amino acid position of the haemoglobin protein (other forms of sickle-cell also exist, but this mutation is the most common). The result is a change in the shape of the red blood cells. People who have both copies of this mutant allele develop the sickle-cell anemia disease, and if left untreated may die. Carriers, however, have sickle cell traits but do not develop the disease. So what’s so good about this mutation? So far in this tale it seems pretty harmful. But the carriers have an unexpected bonus: the mutation in the haemoglobin makes it difficult for malarial cells to penetrate red blood cells. Carriers are thus effectively immune to malaria. In a North American context, sickle-cell anemia is a harmful mutation. In African countries where malarial exposure is high, this mutation is suddenly beneficial. It is still harmful to those with both copies of the allele, yes, but being a carrier is much better than not having the mutation at all. We also now have examples of mutations that are completely beneficial with no apparent dark side. Approximately 1% of people descended from Northern Europeans are essentially immune to HIV. HIV enters cells via a receptor on the cells known as CCR5. People immune to HIV have two copies of a recessive mutation that prevents the production of this receptor, effectively blocking HIV. Carriers have intermediate levels of resistance to HIV. Amazingly, it is thought that this mutation appeared well before the HIV pandemic, perhaps as a result of providing immunity to some other disease, such as smallpox or dysentery. Or perhaps it was a mutation with no real effect on survival, that happened to persist. At any rate, there is today sufficient evidence that mutations really can be good, bad, or neutral, and that it depends on their environmental (and, although I didn’t get into this, genetic) context. So far we’ve been discussing mutations that really only do one thing – alter blood cell structure, inhibit receptor formation. But is it the case that one mutation = one effect? If not, then the value of a mutation just got a whole lot more complex. Tune in tomorrow.